Home > Signs & Signage > Environmental Signs & Tapes > Waste Segregation Signage > General waste non-hazardous sign. Danger Hazardous waste, Handle with care safety sign. 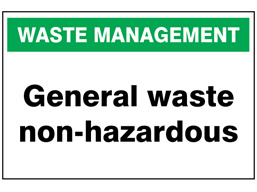 General waste non hazardous recycling sign. Waste material symbol and text safety sign. Waste segregation signs. General waste non-hazardous segregation sign. Part of our environmental management sign range, to distinguish general waste, without any hazardous content. Waste segregation signs. General waste non-hazardous. Waste stream management sign. WASS110 Size 200mm x 300mm. Material self adhesive vinyl. WASS111 Size 200mm x 300mm. Material rigid plastic. WASS112 Size 400mm x 600mm. Material self adhesive vinyl. WASS113 Size 400mm x 600mm. Material rigid plastic.